The end of the school year is looming, which means this is the big final test of the year. How are you going to study? Do you even have to study? 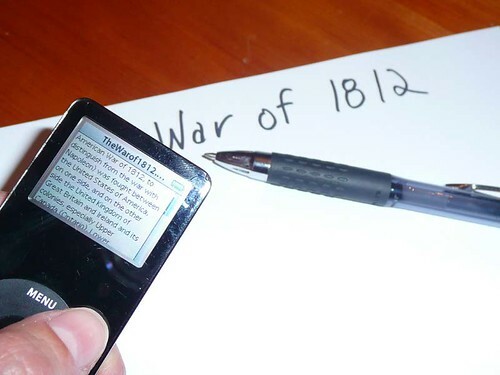 When you can carry the breadth and depth of human knowledge in your iPod, should you be required to memorize all those dates and names? Isn’t it more important to know HOW to find information from reliable resources? Isn’t it more important to know WHICH information should be included? Teachers would respond with a resounding, “NO!” Me, on the other hand, I don’t know. I gave up on the educational system a long time ago and I really feel that learning how to solve problems is more important than the specific names and dates of wars long past. Let’s solve a problem, shall we? Since I just purchased a new notebook PC, Iâ€™ve been taking a good look at the notebook market for the last couple of weeks. Prices are lower than ever for great notebooks, but the growing number of vastly different choices can be confusing. Starting today, this series of posts will look at some of the decisions you need to make to find the right notebook for you. Mainstream: The traditional â€œlaptopâ€ form factor. These machines have screen sizes ranging from 14â€³ to 15.4â€³, and generally weigh 6-7 pounds. They usually have standard-sized keyboards, although there are some unusual key placements to make room for everything. Theyâ€™re a good compromise between portability and usability, making them the most popular category. Theyâ€™re also the cheapest, although prices vary greatly based on speed, features, and quality. Thin and Light: These are smaller, lighter notebooks that are much easier to carry. Screen sizes range from 10â€³ to 14â€³, and the machines weigh 3-6 pounds. While these used to be some of the most expensive machines, low-end models are now competitive with mainstream notebooksâ€”but at this size, thereâ€™s always a compromise. The low-end models usually have slower processors and lack features, like DVD drives, that are hard to miniaturize; at the high end, all of the features are there, but the price is much higher. All ultralight notebooks have smaller keyboards, so you may find it hard to type with even the best models. Desktop Replacement: These are still notebook computers, and portable in theory, but theyâ€™re large and heavy, and best suited to sitting on a desk and being moved only occasionally. Screen sizes range from 17â€³ to 21â€³, and the weight is usually 8-10 pounds. These machines usually have full-sized keyboards, and some even have numeric keypads. Like the ultralight machines, these monsters used to cost a lot more than a mainstream notebook, but the price difference is small now. If you expect the notebook to be your only PC, and donâ€™t plan on carrying it to work every day, these are nice machines. This is probably the choice that will have the greatest effect on how much use you get from a notebook. If itâ€™s too small, youâ€™ll be fighting with a tiny keyboard and squinting to read the screen, and if itâ€™s too large, youâ€™ll leave it at home. So which size should you choose? My recommendation would be the largest one you can conveniently carry everywhere you want to carry it. If you plan on using it at home 90% of the time, portability is less of a concern, but if youâ€™ll be taking it to class or work every day, a pound or two can make a big difference. One of the biggest reasons to choose a larger notebook is the screen. In tomorrowâ€™s installment, Iâ€™ll look at the different types of notebook screens available today, and youâ€™ll learn that more resolution isnâ€™t always better. DVDs have rapidly replaced videocassettes as the format of choice for home video. But making your own DVDs with video from a camcorder is far from easy. Understanding the process helps.